Stop emailing yourself links to stories you want to read later! As you browse around Web sites on your iPad, or look at news stories with your favorite News Reader app… what do you do when you find a article that interests you? Shorter one, you most likely skim right through but for the longer and detailed posts are better left to read in detail later. Most people, and that includes us, will send the article/link to our email so we can find the article later. Some readers will send the full article content in the email, others just send a headline and link. Later comes and you have to sift through the emails and usually you have to jump back online to get to the full content of the article. 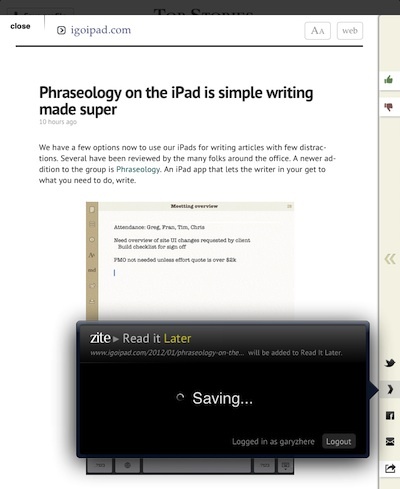 Choosing to send a article to ReadItLater, sends the post to the service for the ReadItLater iPad app to pick up later. When the app loads on your iPad, it pulls down all of the posts you tagged in a Text/Image version. The list of posts will be dark colored till the article is loaded, then it changes to a lighter background. 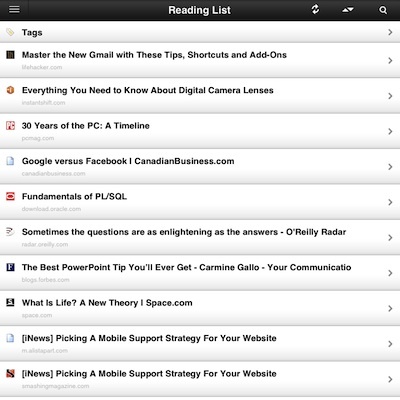 The list can be viewed by Newest, Oldest, Article Title or Provider’s Site. Tapping a headline from the ReadItLater list takes you to a text/image only view of the article. This is loaded in the background when the list builds so it works offline. No need to work through in-line ads or graphic navigation. In the upper right corner of each post is options to refresh the article, choose the lettering size, justification and even share the post out through Twitter/Facebook or save a copy off to your Evernote Cloud account. 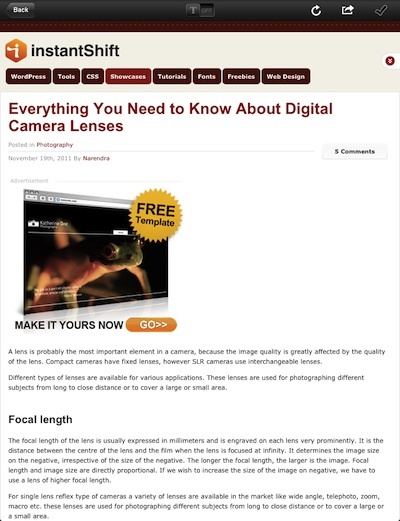 At the top of the page is a slider to move from ‘text’ view to load the actual Web article. This does require Internet access to load. Flipping the switch back, returns you to ReadItLater’s text/image view (no ads or clutter). 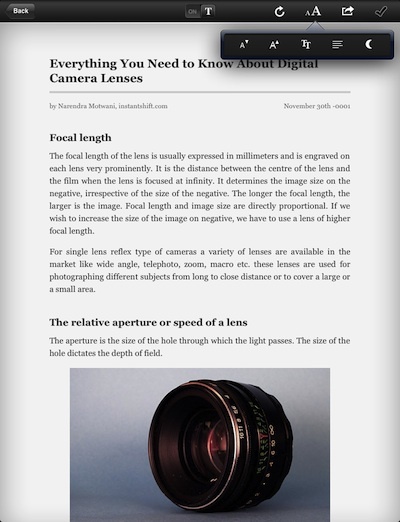 The words in the text view of articles are individual items and not just a screenshot of the post. 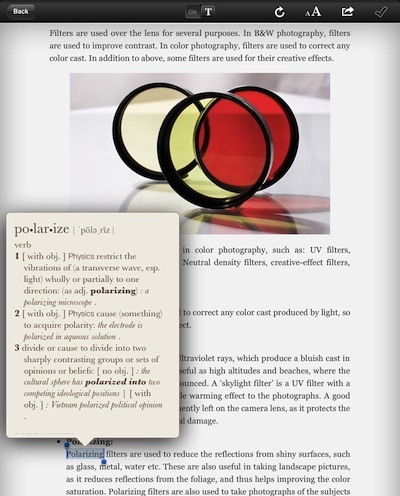 This means you can tap a word to select for copy/paste, as well you can get full definitions from the iPad’s built-in dictionary.